I received Dexter Morgan from Terrestrial Nails on etsy here. I was so excited to get this nail polish because Dexter is my all time favorite TV show, and my first dog’s namesake. I was a bit disappointed in the bottle because it wasn’t what I expected. The labeling was completely different from this brand and different from my other bottles, this being my third bottle. It’s the little details that make me want to purchase from indie polish brands. It was also nearly impossible to get the white glitter out of the bottle and onto my nails. 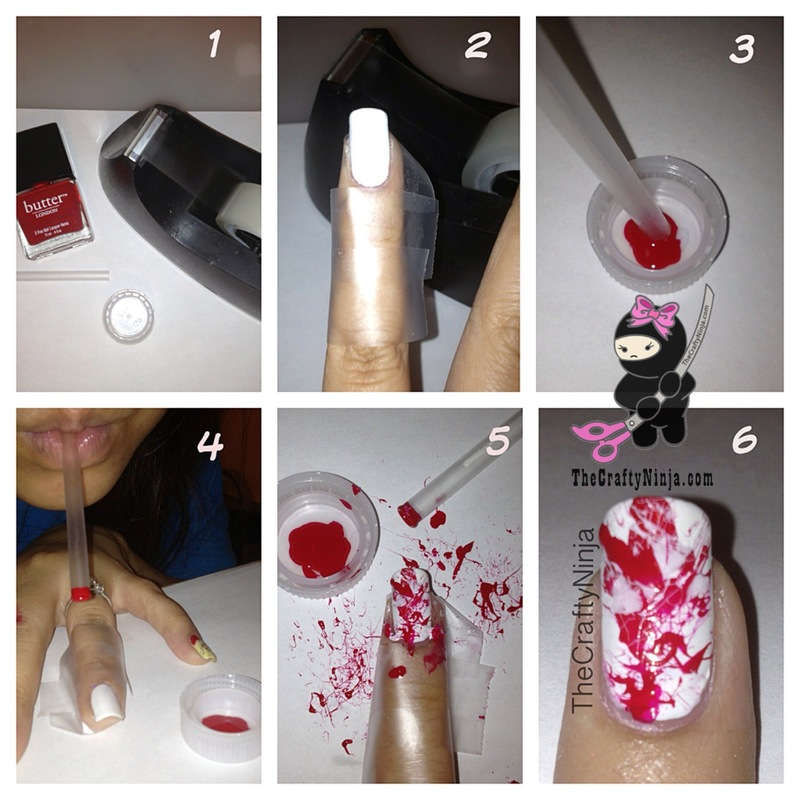 Bloody Splatter Paint Nail Tutorial: Check out my Splatter Paint YouTube tutorial here. 1. The supplies you will need is a straw, tape, Red polish- Butter London Pillar Box red, and White polish- China Glaze White on White. 2. Paint nails with white nail polish, I used China Glaze White on White. Tape around your finger to protect it from getting too messy and for an easier clean up. 3. Dip your straw onto the red nail polish, I used Butter London Pillar Box Red. 4. Blow the nail polish on your nail. 5. I repeated steps 3-4 about three times to get the desired look. 6. Blood Splatter Nails perfect for the blood expert Dexter Morgan.